What would the world be like if technology could accurately predict a heart attack? What could the future be like if technology informed political parties of what the people really wanted and how those candidates could truly help the population? Korea’s BPU Holdings is on the cutting-edge of building technology that can do these things and more. The Korean startup is developing Artificial Intelligence and Artificial Emotional Intelligence that will change the world and improve the lives of billions of people. 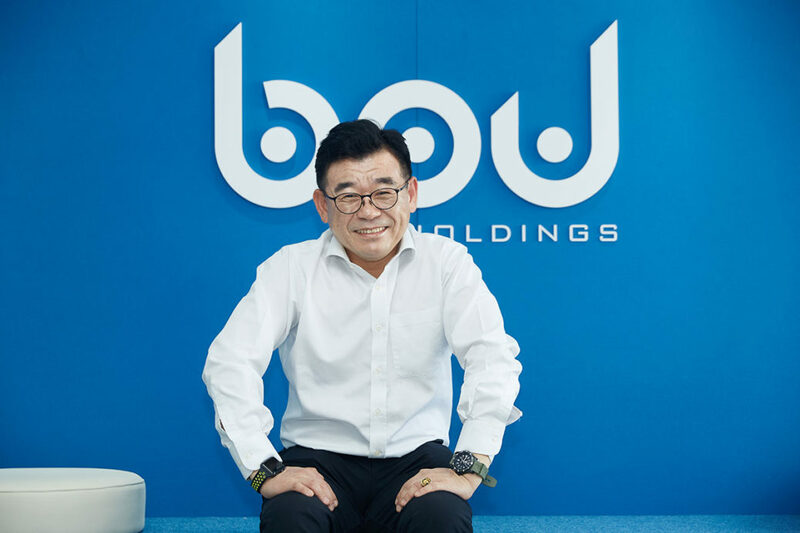 The man behind BPU Holdings’ success and rise in the AI and AEI arena is Oh SangGyoon. A former bank industry employee renowned for creating technology-based products, Oh had a rapid rise through the arena. His innovations have been adopted by banks from all over the world, cementing him as one of the brightest minds in finance. After dedicating years to the banking industry, Oh sought a new challenge, and created BPU Holdings. The startup has given Oh the chance to work with two areas he has a great passion for: AI and AEI. Oh is now working with his team to further develop Artificial Emotional Intelligence to enhance technology to be more personal. Like in the banking arena, Oh believes his innovations and team will revolutionize the world. Oh recently took time out of his busy schedule to speak with Totalprestige Magazine about his work, life, and the future of AI and AEI. Mr. Oh, please tell us about BPU Holdings and the services customers can expect from the company? Customers can expect a variety of products and services from BPU. Currently, we use AEI for political forecasting and analysis in our ZimGo Polling product. Neil is a personal news curator that is teachable. An AEI for news, it learns what a person likes and finds noteworthy content to match those tastes, while learning the user’s personality. He is your own private, ad-free chatbot – a virtual assistant whose goal is to find reputable articles, searched by single words. AiMei is an EI application, fully dedicated to helping people understand themselves and their relationships, and to improve on both. The aiMei framework is a sophisticated AEI bot framework that can be used to develop digital assistants for medical, political, human resources, customer service, and many other applications. ZimGo is our AEI search engine, it is focused on improving search by using sentiment analysis, and indeed ZimGo is used by the other AEI’s to do their work. Ultimately, ZimOS is our latest product aimed at applying emotional protocols to the management of the rising IoT world. How did your career in technology get started? I started my career in the banking industry. I was the fastest promoted banker in Korean bank history – at least I like to think so. I introduced, designed, and developed emerging technology-based products such as the Affinity Card. It was a worldwide settlement bank service which provided a gateway service for rapid payment and certificate issuing. A fond memory I have of this job was managing the entire process from hard coding to product release. Prior to BPU, I did a lot of coding in my career – including hacking. As an entrepreneur, what led you to BPU and how has it differed from your previous work? In our case, we are working in completely uncharted territory. Pursuing the simulation of emotion by software has been a long-lived pursuit. Until recently, companies would not have attempted what we do. If they did, they died quickly. At this time, the advancement in processing power, speed, and availability, as well as the explosion of interest in Artificial Intelligence has really piqued public interest. We usually run into the first response to our technology with skepticism; however, as we have been able to prove time and time again, our ability to analyze human emotion has proven to be a very powerful source of political information while being extremely accurate. As we expand our model towards personal AI’s, we are focused on understanding individual emotional and psychological models. All these things will take time to prove themselves in science and the marketplace. BPU is something I’m incredibly passionate about. My success is the company’s success and vice versa. Our wins mimic each other and I’m thrilled to take this journey with my team. From a spiritual point of view, I believe BPU Holdings was my calling from the guy upstairs. To create, to contribute, and to improve people’s daily lives – and the world. Can you tell us about some of the innovations BPU Holdings is making in the world of Artificial Intelligence and Emotional Artificial Intelligence? ZimOS is BPU’s Operating System Cloud service that encapsulates all of our products and services together. This allows the individual or enterprise to invert AI and AEI to a more personalized, synthetic, emotional emulation. ZimOS is your personal AI that learns to securely and automatically assist you with the ever-increasing complexity of a connected, mobile and social life. ZimGo Polling is our political forecasting platform. It adapts and connects to the empowered citizen in ways not possible with legacy tools. Using hyper-accurate segment targeting, it alerts candidates directly about topics and subjects citizen voters want to know about. Campaign slogans are a promise to the public, but too often the harsh reality is that voter concerns are ignored. ZimGo Polling offers to bring those specific issues to light. This way, it’s acknowledged and hopefully, addressed. Another platform we have is ZimGO.com. It’s our search engine that updates every day. One unique feature is that has the ability to search SNS in both words and emoji symbols. For example, it is able to distinguish -__- or ///::\\\ and other emoticons. When the emoji symbols are searched with other competing engine sites, only ZimGO is able to distinguish the sentiment with the appropriate feelings. ZimGO can be valuable for anyone who is interested in searching a specific topic or genre. Students, journalists, and researchers alike, are able to utilize our search engine that goes beyond traditional search engines. Furthermore, if someone wants to search YouTube, they can do so on our ZimGO site. Our patent filing technologies such as pattern recognition and real-time emotions will be valuable for everyone. What is ZimGo Polling and how will it change elections in the future around the world? BPU Holdings has been passionately developing state-of-the-art technology called Artificial Emotional Intelligence (AEI) and sentiment analysis. BPU’s advanced, AEI-driven NLP, big data and machine learning generate pioneering results that polling history has never witnessed before. Near real-time, ZimGo Polling estimates polling results for the elections and how people feel about the candidate’s campaign and his or her political strategies. Whereas, all pre-existing polling methods need to go through consecutive process of modeling, sampling, panel creation, questionnaires and answers. ZimGo Polling requires none. It only requires the list of political candidates and keywords that the person wishes to analyze. In effect, ZimGo Polling eliminates all forms of human-induced bias surfaced during the steps typically taken in traditional polling and other alternative methods. ZimGo Polling can gather millions of Tweets and Facebook updates in a flash and accurately conduct sentiment analysis using such big data. Afterwards, the analysis is transformed into quality estimation that can be charted in graph, table, geographic map or various other forms. In an instant, all data can be analyzed in chronological order. The user (political candidate) can immediately learn about the public sentiment towards her or him as well as sentiment towards their competitors. In accordance with geo-location information, she or he can closely trace the public’s fluctuating preferences, daily, periodically and even hourly. In short, ZimGo Polling provides its client with the analysis on Tweet count, sentiment scores, and estimated voting rate metrics. Additionally, it delivers political preference analysis of the public, geo-location, rationale, age-group analysis, comparative analysis of political issues and respective advocacy rate of the candidates. In 2017, Republic of Korea’s presidential candidate Moon Jae-In (the current President) utilized ZimGo Polling for a period of two months. By combining its engine data with South Korean demographic data, ZimGo Polling estimated daily regional voting rates for each candidate. It then provided daily reports on Tweets statistics, public sentiment scores for the candidates, advocacy rate, and political issues raised per candidate for each of those issues and other relevant analysis. Consequently, the Moon campaign established keen strategies and actions based on the reports that ultimately won the presidency. The presidential election results proved ZimGo Polling’s near-perfect accuracy in its assessment of voting rate fluctuation in association with campaign events such as TV debates. Vote counts also revealed that ZimGo Polling’s ranking estimation was perfect, meaning that all candidate rankings were exactly as forecasted; whereas, its voting rate estimation was negligible in most cases and at worst it had a 2% margin of error. All candidates were forecasted in the right order with an extremely accurate number of corresponding votes. In 2018, ZimGo Polling provided its service to the ruling Democratic Party of Korea (Minjudang) for its Seoul mayor primaries. Again, ZimGo Polling boasted of approximately 95% accuracy in its final estimation. We attributed the reduced accuracy to the reduced amount of data in a mayoral versus a presidential campaign and other related factors. Currently, mental health is a big topic around the world. What can Artificial Intelligence teach us about mental health? I think there’s a correlation to AEI and mental health. One of our products is the aiMei Framework. She is an emotionally intelligent automated assistant, able to proactively interact with the individual. aiMei communicates directly to monitoring devices to measure user activity and overall emotional and physical health. With the rise of mobile and activity bands such as: Fitbit, Apple Watch and Garmin, we have the ability to monitor health, effortlessly. They can measure pulse, vitals, step count, and even quality of sleep with unmatched accuracy. aiMei Framework goes beyond these measures and interacts with other AIs to communicate with users. Using expert developed dialogue, it links to other existing AIs like Alexa, Google Home, Cortana, and many other interactive AIs to be a 24-hour automated assistant. It can ask questions to determine mental or emotional states – even further, recognize potential scenarios of self-harm. With medical patients, aiMei can be used for voice-distress detection. Cardiac patients can report pre-heart attack symptoms, blood pressure levels, and state of emergencies can notify their doctors and their hospitals directly. In the hospital, aiMei can be used to supplement nurses who are in short-demand and provide patient with a near-constant caretaker. In the home, aiMei is a companion. In the workforce, aiMei can help companies and individuals maximize performance. Happy employees equate to successful companies. aiMei can also be used to manage human resources by using anonymous applications. An employee’s state of well-being, emotional status and stress levels go beyond the standard management review. Like medical devices, aiMei can monitor heart-rate variability to determine patterns that trigger dangerous heart rates, high blood pressure, and even extreme fatigue. These warning signs can be critical in helping a company build an environment where people feel safe, trusted, healthy, empowered, and understand their contributions to the progress the enterprise. An employee’s emotional state can better determine how to navigate professional benchmarks, reviews, and overall maximum return. Our emotions play an integral role in how we communicate and cultivate our relationships. Emotional Intelligence and the awareness of our EI is vital to helping people understand themselves better; in turn, improving their relationships. EI can keep us in-tune with our social, physical, and mental states and interactions every day. Can Artificial Emotional Intelligence eliminate mental health issues in the future? Artificial Emotional Intelligence and the rising number of technologies can help us monitor biometrics to correlate psychological metrics that can be huge advances in human development, medical practice, and possibly save lives. AEI turns subjectives into objectives. Just like how we cannot control heart-rate spikes or heart palpitations, the same goes for our emotions. The aiMei Framework is a tool to get users to be aware – not just with oneself, but how others feel about the user. It lets the people closest to you rate you, your strengths, and your weaknesses. This encourages the user to be able to reflect on him or herself. As such, we’ve had great responses on aiMei Framework. People seem to be really excited about it. Many people today ask, “what do you do?” rather than “how do you feel?”. Mental health and well-being are a priority. Too often we see the effects of depression to oneself and the families and friends of those who are suffering – both mentally and physically. With aiMei Framework, it is one step closer to closing the gap between depression and a healthy state of mind. Can you tell us about BPU allocating 30% of its profits to ‘public good’? The first Chapter of BPU’s Articles states that BPU’s purpose is to allocate 30% of its profits to the public good. During the early days of the company, we had our own financial challenges, as any startup would. When we started to gain momentum, I made a decision with my Executive team that we would allocate a percentage to the public as a baseline of our manifestation. BPU is headquartered in Seoul, Korea. Are Asian companies on the cutting-edge of the Artificial Intelligence Movement more than western companies, and if so, why is that? Korea is a 5000-year-old county, as indicated in the The Korean Pavilion in the British National Museum in London. During the 1400s, the Chosun Dynasty was the highest economical country with advanced ways of living. As early in the 15th Century, Korea governed on a voting system. It is a culture that believes that every opinion counts and each person can make a difference. Public readings and voting systems took place for agendas like tax and tariffs. The idea of having an open forum lead to a successful ruling for hundreds of years. As such, the shortest known dynasty to reign lasted 550 years. This is pretty significant considering no other dynasty in China and Europe ruled for so long. I don’t believe a single ruling king or queen made this possible, but it was the devotion of its people and academic cultures. I still think applies today. I believe Asia’s technology has been more advanced than outside infrastructures for quite some time. Given our small size, South Korea has an enormous bandwidth of advanced technology services – both in e-commerce, consumer, and AI-based products. Culture also plays a role in technology. Seoul is a consumer-driven society where everything can be done on a basic smartphone. Rapid delivery from most restaurants, groceries, books, and even vice items like alcohol and cigarettes can be delivered to your door within minutes. The subway system is also advanced with having wireless and data access within every underground tunnel and station. Korean companies like Samsung, SK Holdings, and LG, continue to lead the country’s economic growth and business. After electronics, the next step is AI; so naturally, that was the direction many companies – both large and small, are headed towards. To leverage high competition, we knew we had to form partnerships. We planted offices in both Las Vegas, Nevada in the U.S. and Bosnia Herzegovina, comprised of our Development team to focus on our products. Diversity is also a core of BPU. We have 43 employees in our Seoul office from different countries such as: France, India, Japan, Korea, New Zealand, Sweden, and the US. Our diversity brings us closer together. This diversity – we believe, makes our combined EI higher. What do you see occurring in the Artificial Intelligence arena in the next decade? I believe AI will soon become obsolete and AEI will be everywhere. AEI will become the next service in our daily lives. It will affect commerce, consumer products (if not already), and most importantly, how we communicate and sustain our relationships. I also believe it can help us countermeasure invasive software. Mr. Oh, what is a day in your life like? Rather than a day in my life, I tend to think about the day itself. What if a day was longer than 24 hours? Spending time with my family and doing late night ice cream runs with my two daughters. The feeling of being off track. King Sejong who invented the Korean alphabet and native script in the mid 15th Century. I admire his innovation and ambition to bring people together with the power of scripted words and language. Mr. Oh, do you have any hobbies? I love operating any type of vehicle, vessel, or airplane. Whether it be a car, yacht, plane, or even a horse, it gives me pleasure when I’m in control of steering something. Flying airplanes is definitely my favorite, but driving my Jaguar is also satisfying. My glasses, phones, and watches with multiple city time zones. Instinct versus expertise. Which is more important and why? Instinct. I’m very intuitive and I believe there’s a reason for “gut instinct”. Although I may not always be accurate, I think sometimes you have to go with how you feel. Logic is absolutely important in business, but sometimes you just have to go with what feels right – even if that means taking higher risks. To end suffering. I’d like to eliminate the common burdens of people and children. It would be incredible to stop the process of aging as well. For more information on Oh SangGyoon and BPU Holdings’ AI and AEI technology, please visit https://bpuholdings.com.